Inciting Event: Roger Bartlett, “Big X,” arrives at the camp and immediately reveals his plan to engineer the biggest escape from a German POW camp in history. Subplot: Hilts tangles with the Commandant for the first time and is sent to the cooler. First Plot Point: The tunnels, “Tom” and “Harry,” are started beneath the stove in one hut and in the shower drain in another. Subplot: Hilts and his cooler buddy Ives are released. They attempt another escape and are immediately returned to the cooler. First Pinch Point: The tunnel collapses on Willy, one of the Tunnel Kings, and Roger realizes he’s going to “have to shore up the whole bloody tunnel” with wood. Subplot: Roger asks Hilts to reconnoiter the woods and town when he escapes—and allow himself to be recaptured to share the information. Hilts indignantly refuses. Midpoint: During the men’s Fourth of July celebration, their nearly completed tunnel “Tom” is discovered by the Germans. Subplot: Hilts’s buddy Ives attempts to escape over the wire and is shot, prompting Hilts to change his mind about helping Roger get the info he needs. Second Pinch Point: On the night of the escape, Hilts opens up the end of the tunnel and discovers the hole is twenty feet short of cover in the woods. The timing of the turning point in the Second Half of the Second Act is actually the beginning of the escape, but this isn’t the Pinch Point, since there’s no emphasis on the antagonistic force or the stakes. So we know Hilts’s discovery is the Second Pinch Point, even though it’s a few minutes late. Third Plot Point: Halfway through the escape, the Germans discover the tunnel. Climax: At the train station, Roger is recognized by the Gestapo. Ashley-Pitt, another of the escaped prisoners, tries to save him and is shot. This is the first time one of the prisoners is recognized, and the first time one of them is killed. It marks a clear turning point in the fate of the Allies in the Third Act. However, this moment does come a little early in the timeline. Right at the 75% mark, we find the scene in which the American Hendley and his blind friend Blythe crash their stolen plane just short of the Swiss mountains and Blythe is killed by Germans. This isn’t the turning point into the Climax; that already happened earlier when Roger was recognized and Ashley-Pitt was killed. But this is decidedly the more emotional scene, so it’s interesting to find it spot on the money in the timing of the Third Act. You could argue it’s the beginning of the emotional climax. Climactic Moment: The fifty captured prisoners, including Roger, are shot by the Gestapo. 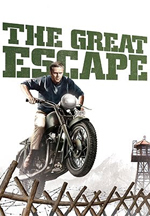 Subplot: Hilts crashes his stolen motorcycle into the barbed wire and is re-captured. Resolution: Hendley, Hilts, and the other surviving prisoners are returned to camp. Willy, Danny, and Sedgewick are shown escaping. Notes: There are a couple interesting things to note in the structure here. First of all, as you can see, the Hilts subplot is prominent at all of the major turning points, until it briefly melds with the main plot from the Midpoint through the Third Plot Point. This character is really a very minor one who gets comparatively little screentime, but he becomes important to the plot thanks to his prominence at big structural moments. He always shows up when something important is happening—even if he’s not directly involved in it. Prior to Inciting Event: Introduction of the new camp. Inciting Event to First Plot Point: Planning the escape. First Plot Point to Midpoint: Digging the first tunnel. Midpoint to Second Pinch Point: Digging the second tunnel. Second Pinch Point to Third Plot Point: Escaping through the tunnel. Third Plot Point to Climax: On the run through Germany. Climax to Climactic Moment: Being re-captured. Finally, the Resolution is notable for a marvelous manipulation of tone to create a positive ending amidst the tragedy–without being on the nose. This is due to several factors, but the most prominent is the brief exchange between Hendley, after he’s been returned to the camp, and his C.O. Ramsey. Ramsey: Roger’s idea was to get back at the enemy the hardest way he could. Mess up the works. From what we’ve heard here, I think he did exactly that. Ramsey: That depends on your point of view, doesn’t it, Hendley?